Medipedia’s blockchain solution for Medical Tourism Industry has been rave reviews from all corners of the blockchain industry. The project started with the publication of the first white paper in June 2018 and in the last quarter of months, Media has accomplished quite a few feats that deserve a special mention. First among these is the successful completion of the Pre Sale of MEP Token. MEP Tokens are EOS environment tokens that not only make transaction free but also scalable. Other important milestone was recognition and fostering by incubator program “BlocBox”. Mediapedia now stands at the cusp of another milestone in its short lifetime of being a Blockchain Innovator. Today the 1st Round of MEP Crowdsale goes live. Medipedia Team hopes to surpass all expectations during Medipedia 1st ICO Sale. Here are some important details for Medipedia’s 1st Round of ICO Sale. 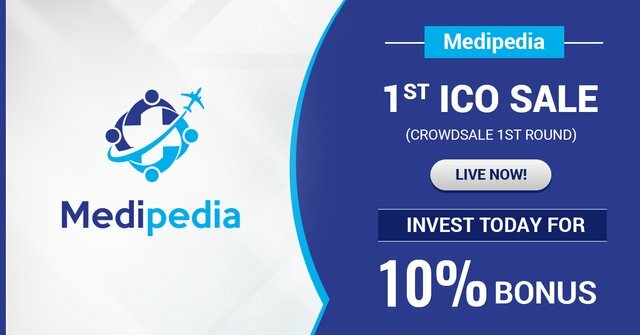 The Medipedia 1st Phase ICO Sale started today at 08/10/2018 00:00 GMT. The MEP token has been pegged at USD $0.01. The hard cap is USD $10 Million and the Soft Cap is USD $1 Million. A 10% Bonus on total purchase will also be on offer during the 1st round of ICO Sale. Mediapedia will offer 50% of the total MEP Tokens Published Initially. Part of the Fund from ICO Sale will be used for development of the Medipedia platform and the creation of a medical service ecosystem. Potential Buyers can participate in the ICO using popular cryptocurrencies Ethereum (ETH), Bitcoin (BTC), Litecoin (LTC), EOS or ATBcoin. MEP Tokens will directly be sent to the participants personal wallets. MEP Tokens can be used to avail platform services by ICO participants, doctors, medical service providers and medical consumers alike. The Medipedia Platform ensures credibility and transparency of medical service procured through the platform. Also, Medipedia being a decentralized service ensures peer to peer consultation between patients and doctors. This reduces medical costs by a significant amount as well as increases consultation options. Last but not the least medical service provider also stand to gain from Medipedia platform through better visibility, first-hand communication with patients as well as additional profit from MPR Reward Points. Here are the details of the Medipedia 1st ICO Sale (Crowdsale 1st Round).